Today, the preferred method of tooth replacement is a dental implant. They replace missing tooth roots and form a stable foundation for replacement teeth that look, feel and function like natural teeth. Dental implants also help preserve the remaining bone by providing the stimulation previously provided by the natural tooth roots. Dental implants are similar to teeth in that they mimic the shape of the roots of teeth. They can be used to support individual teeth or to help anchor removable dentures. Using local anaesthetic, the implants are surgically placed under the gum and into the bone. The healing period for dental implants vary depending on the location and the health of the bone. The healing period for dental implants vary depending on the location and the health of the bone. It can be as little as six weeks or as much as six months. Some form of aesthetic temporization is always placed in visible areas. 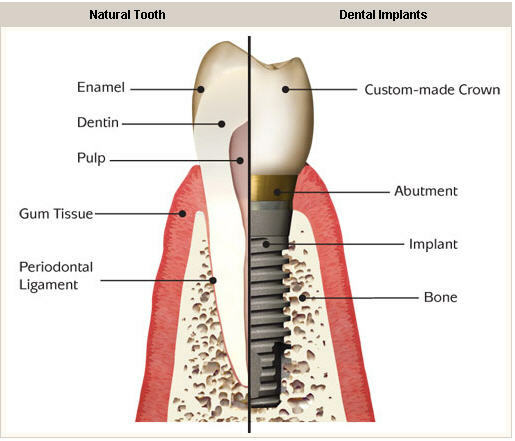 Once the Implant is biologically attached to the bone ,a post (abutment) is connected on to the implant. • Maintain Anatomy: If you have missing teeth, the bone begins to shrink over time. Unhealthy bone loss can make your jaw line recede and change your facial structure. Dental implants can help prevent deterioration of the jawbone so your face retains its natural shape. • Keep your healthy teeth: A better long-term alternative to bridgework, dental implants eliminate the need to grind down healthy teeth when replacing one or more adjacent teeth. Your own natural healthy teeth are not compromised. • Security: Securely anchored dental implants do not slip or move. This eliminates some of the key problems of dentures, including poor fit, gum irritation and pain from exposed nerves. The result is superior comfort, reliability, and freedom from embarrassment. In the past, patients who lost their teeth had to settle for dentures or bridges to fill the gaps. at certain times the dentures would get loose and speaking or eating gets hard. These basic tooth replacement options also cannot stop the bone loss in the area where there tooth was previously extracted. Recent development in dentistry can now offer an advanced solution, where the missing teeth can be replaced by gum line to create a permanent replacement along the jaw bone. A dental implant is an artificial replacement of the root of the tooth and is used in prosthetic dentistry as a means of supporting restorations that act as teeth. Dental implants are placed into the jawbone of the patients mouth and function as the root of the patients tooth. Surprisingly, dental implants have actually been around for many years. Dental Implants date as far back as the Mayan civilization, 1,350 years ago. However, the use of titanium was only discovered in the 1950s, and in 1969 a US Patent was filled for titanium dental implants. Titanium has a unique property that, unlike most foreign substances, the body does not reject it. When the titanium implant is placed into the mouth, the organism adopts it as its own by actually growing bone around it so that it effectively adheres to the titanium. A dental implant looks a bit like a screw and can be implanted into the bone of the jaw at the same time as the natural tooth is removed by placing the implant into the socket wall. Dental Implants should be placed by a dental specialist who has had formal postgraduate training in dental implant dentistry. If the dentist has not received sufficient training, complications could arise. Qualified implant dentists who are highly trained experts in dental Implantology and should be your number one port of call for carrying out the dental implant procedure. At the start of the procedure the implant is placed in the gap/open space. This technique is mostly completed in one sitting at the clinic of the dentist or oral surgeon. The implant after being placed leads to a phase known as Osseointegration. Through this phase the implant mixes with the jawbone to turn into an everlasting fitting in the mouth. Osseointegration mostly takes almost three to six months to finish and during this phase the remaining implantation procedure could be done. plan for you. Periodic follow-up visits will be scheduled to monitor your implant, teeth and gums to make sure they are healthy. The first visit consists of a consultation. During this essential dental x-rays are obtained and the area where implants will be placed is evaluated to make sure that the quality of the bone is good and quantity of the surrounding bone is sufficient to support an implant. A diagnostic impression is also taken. The implant is placed in the jaw bone and allowed to heal and incorporate with the surrounding bone. The time it takes for a dental implant to integrate with the hard tissues varies between 4-6 months. 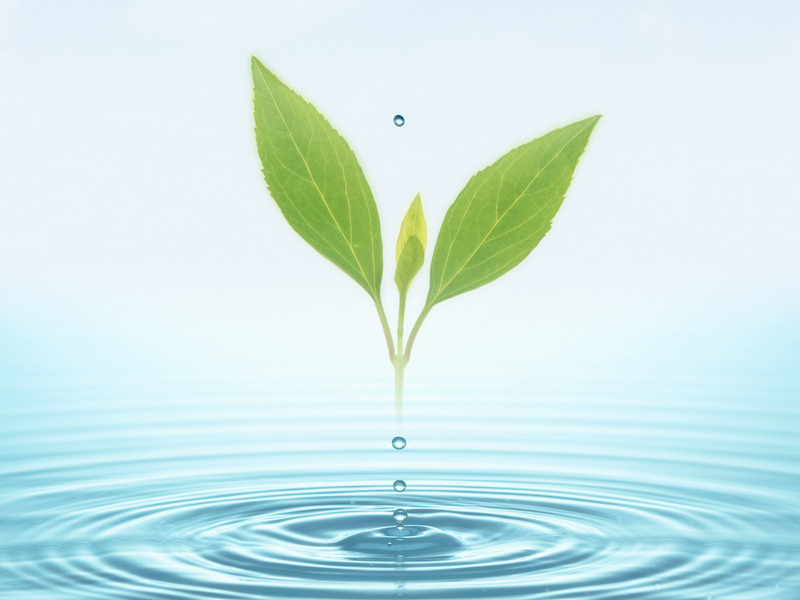 Some of the main factors that can affect healing include the location of placement, general health of the patient, quality of bone , health of the surrounding area where implant is placed, type of dental implant used, and oral hygiene of the individual. All these factors can determine how fast and how well the implant will integrate. After a dental implant is placed it can take anywhere from 3 to 6 months before the final restoration is completed. Implant placement is completed with just local anesthesia and the whole procedure is performed under sterile conditions. Impression for a crown is taken. Your implant dentist will attach an impression piece to the implant and obtain a dental impression for the crown. In case of an implant supported overdenture, it will begin with the fabrication process begins with the final impression of the surrounding tissues and dental implants. The new crown is tried in place on the implants, to confirm a perfect fit and good color match with surrounding teeth, and is finally cemented in place. An implant-supported denture with the teeth set in wax would be evaluated for aesthetics, function, proper speech and stability. Adjustments are made if needed. Any changes to the position of teeth to improve cosmetics and speech should be made during this visit. Denture is sent to a dental laboratory for the final processing. Implant-supported overdenture is delivered. Special overdenture fixtures are attached to the dental implants and the denture is tried in. The implant-supported denture should have excellent stability. The dentist can modify the retention of the denture if necessary. Slight bite adjustment will be made to ensure an even perfect bite. In implant dentistry, the most popular form of dental implant is the root implant. This type of dental implant is very effective and mirrors the size and shape of a patient's natural tooth. Many times, this implant will be as strong structurally as the original tooth's root. Once the dentist applies the local anesthesia, he or she makes an incision in the gum in order to gain access to the jawbone. The bone is then prepared, and the dental implant is inserted into the jawbone with care and precision. Finally, the dentist stitches the gums and, if necessary, prescribes an appropriate medication. During the osseointegration step, which lasts anywhere from three to eight months, the jawbone firmly attaches itself to the dental implant. Once osseointegration is complete, the patient returns to the dental office, where the dental implant is fitted with the new tooth. Another form of implant dentistry is the plate form implant. This dental implant is ideal in situations where the jawbone is not wide enough to properly support a root implant. The plate form dental implant is long and thin, unlike the root implant, and anchors into thin jawbones. The insertion process is the same as for a root implant, but in certain cases, plate dental implants are immediately fitted with the restoration without waiting for the osseointegration period. 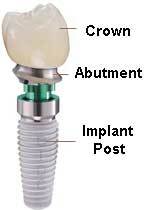 The last type of dental implant used for implant dentistry is the subperiosteal implant. These dental implants are utilized when the jawbone has receded to the point where it no longer supports a permanent implant. These implants are placed on top of the bone and embedded in the gums, but not in the jawbone as with the other types of dental implants. The dentist applies a local anesthesia, and makes a mold of the mouth and jawbone. 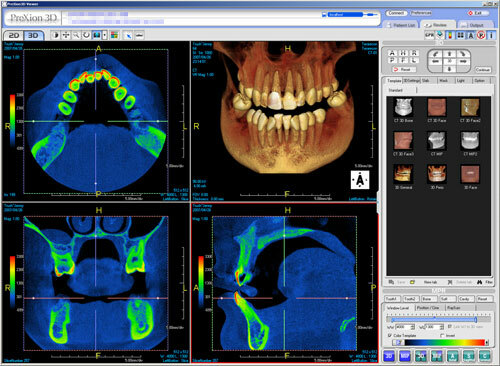 From this impression, a dental lab constructs implants to custom fit the patient's jaw. On the second visit to the dentist, the dentist exposes the jawbone and inserts the dental implant on top of it. Over the next month the gums grow up and around the implant. This same type of implant can sometimes be performed in a single procedure with the use of an initial CAT scan of the gum line and jawbone. Many factors are attributed to failure of a dental implant, either directly or indirectly. The cause is often related to a failure in the Osseointegration process (The growth action of bone tissue). For instance, if the implant is placed in a poor quality bone, or incorrect position,Osseointegration may not take place. Dental implants may break or become infected (like natural teeth). Regrettably, dental implant failure is a common occurrence. even when proper procedures are followed, things can go wrong. When you're dealing with the human body, it isn't possible to have 100% predictable outcomes. But when treatment standards are compromised, it invites difficulty. Inadequate medical history: There are many medical conditions that affect the success of dental implant treatment. Thoroughness and care by the dentist can prevent dental implant failure later. Low quality dental implant fixtures: There are over two hundred companies that manufacture these fixtures, but only a handful of have published juried research with test results documenting the quality of those fixtures. Incorrect tooth implant placement: This could be tied to an inadequate diagnosis, because it's during the diagnostic phase that the decision is made where to place the implant. It could also be the fact that most dentists place dental implants with only a two-dimensional panoramic x-ray. While such x-ray is adequate for most dental surgery, it isn't sufficient for properly placing implants. The success of dental implants is highly dependent on the skill of the dentist performing the dental implant procedure. It is however worth bearing in mind what could go wrong and why it is so important to choose a cosmetic dentist who has years of experience and is a known expert in the field of cosmetic dentistry and more importantly dental implants. The effects of missing teeth can be quite detrimental to your long term oral and general health. Missing teeth are also known to be associated with old age and can make you look older than you are. Replacing missing teeth can dramatically improve your smile and the shape of your face. This greatly enhances both your dental health and self-esteem. An Off-bite Relationship; having gaps where teeth are missing affects the way the jaw closes. The remaining teeth begin to tilt and drift into the gaps. In addition, food can become trapped in these spaces, increasing the risk of decay and gum disease. The tilting and drifting can also cause problems for the opposing teeth. An opposing tooth will begin to hyper erupt and begin to drift into the open space of the missing tooth, causing the opposing jaw-line to have bite relationship problems; thus beginning TMJ problems (problems with the jaw joint). Jawbone Deterioration; As soon as a tooth is lost, either from gum disease or an extraction, the supporting bone in the jaw begins to dissolve. This process is called resorption. The longer a tooth is missing, the greater the bone loss. Benefits of Replacing a Tooth Immediately; A tooth should be replaced as soon as it is lost. This will retain your oral health by preventing bone loss, reducing movement of surrounding teeth and avoiding excess decay. Teeth provide more functions than just the ability to chew. They are essential for the health of the gum and jaw tissues as well, and a prolonged absence of a tooth will severely limit the possibilities for restorations. Missing teeth could also affect your confidence and well-being. There are several options to consider when replacing missing teeth. Dentures and dental implants are the two most common solutions. The two differ in longevity, comfort, confidence while wearing. •Aesthetic Dental implants look and feel like your own teeth! Since they integrate into the structure of your bone, they prevent the bone loss and gum recession that often accompany bridgework and dentures. No one will ever know that you have a replacement tooth. • Tooth-saving Dental implants don't sacrifice the quality of your adjacent teeth like a bridge does because neighboring teeth are not altered to support the implant. More of your own teeth are left untouched, a significant long-term benefit to your dental health! • Confidence Dental implants will allow you to once again speak and eat with comfort and confidence! They are secure and offer freedom from the irritating clicks and wobbles of dentures. They'll allow you to say goodbye to worries about misplaced dentures and messy denture adhesives. • Reliable ; The success rate of dental implants is highly predictable. They are considered an excellent option for tooth replacement. • Immediate Placement Fractures, decay and other conditions can prevent the successful completion of root canal treatment. Fortunately, if this is anticipated, it is possible to remove the tooth and immediately replace it with an implant. Osseointegration is a biologic concept. It refers to the formation of a direct interface between an implant and bone, without intervening soft tissue,i.e. 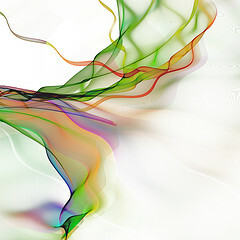 the incorporation within living bone of an inanimate component. This is in essence an anchorage mechanism – nothing more, nothing less. such reliable anchorage allows the attachment of prosthetic to the bone by means of using fixtures (dental implants). This phenomenon was first observed in the early 20th century, and dental surgeons realized the implications of osseointegration very quickly. Only certain materials can undergo osseointegration, with titanium being one of the most popular choices for procedures in which osseointegration is the goal. With other materials, the tissue will fail to grow into and around the implant, and it will not anchor. 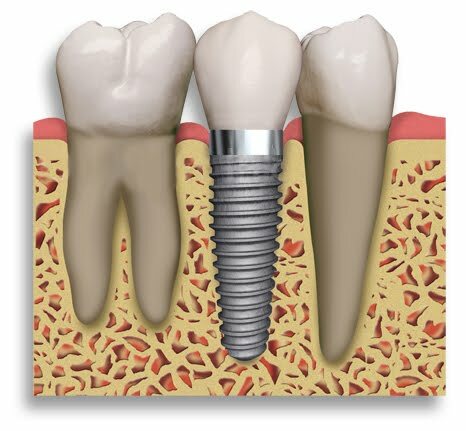 One of the obvious uses for osseointegration is in the placement of dental implants. These tooth implants can be osseointegrated into the jaw, allowing the implant dentist to fit a tooth onto the implant. Cosmetic dentistry and reconstructive dentistry can both take advantage of this implant technique. 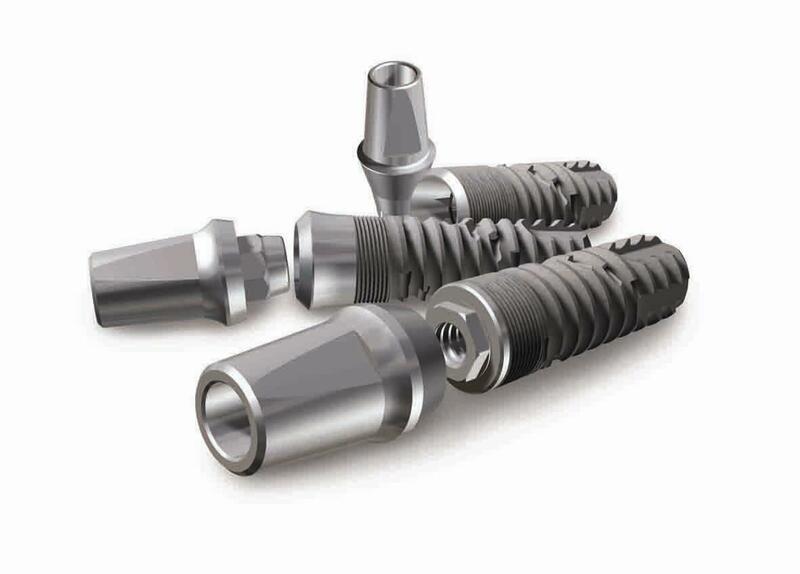 The success of dental implants and osseointegration process has been proven beyond all doubt, but successful achievement of osseointegration depends on careful planning,advanced surgical techniques and skilful restorative management. It demands on appreciation for extensive human biology and an understanding of wound healing in particular.